Renewable energy, by definition, is inexhaustible or, at least, it can tap the sun's energy for times that can be considered infinite from our viewpoint. 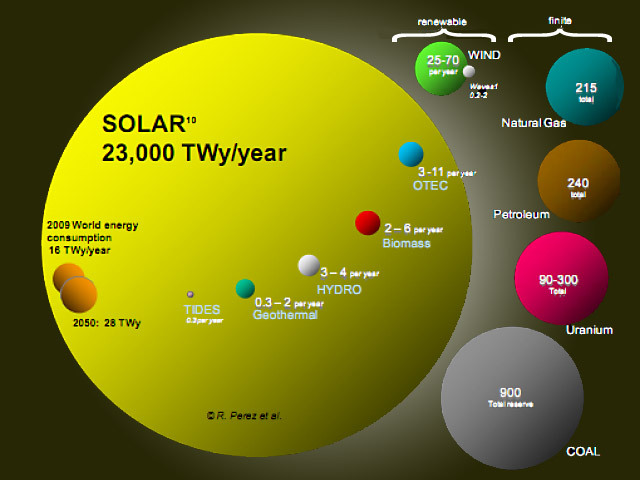 However, renewable energy doesn't live of sun alone. It needs metals, semiconductors, ceramics and more. A criticism often leveled against renewable energy is that it is not really "renewable" because it uses elements which exist in limited amounts and cannot be recycled. The question is complex and it depends on the kind of energy we are considering. For instance, in the case of solar cells, some use exotic and rare materials such as gallium or tellurium. However, the standard version on the market uses almost exclusively silicon and aluminum for the cell. The only rare element in it is silver for the back contact, but it can be eliminated with minimal or no loss. In several other cases of renewable technologies, rare metals are not used or can be efficiently recycled. A recent (2014) study on this subject has been performed by the Wuppertal Institute. The conclusion is that the problem of mineral availability for renewable energy technologies is not critical if we choose the right technologies and we are careful to recycle the materials used as much as possible. The Federal Government’s energy concept ascribes renewable energies the role of an “important pillar of future energy supply”. According to targets set by the Federal Government, renewable energies are to account for 18 per cent of gross final energy consumption by 2020, rising to 60 per cent by 2050. If only electricity generation is considered, the proportion of gross electricity consumption contributed by electricity from renewable energy sources is to increase to 80 per cent by 2050. However, it is not only energy supply or climate protection criteria that play a crucial role in realizing the energy turnaround and, in particular, the development of renewable energy sources – a comprehensive sustainability assessment of the individual technologies must be made taking into account a variety of criteria. Such criteria include short- and long-term cost considerations, energy security, the impact on land use and the countryside, social acceptability, environmental impacts and resource requirements. When it comes to resource assessments, it is recognized that the overall resource utilization of an energy system is generally considerably lower if it is based on renewable energies (albeit not primarily on biomass) rather than on fossil fuels. The main reason for this is that the primary fossil energy sources deployed for the provision of final energy (electricity, heat and fuels) should be considered as resource utilization. However, this does not necessarily mean that renewable energies must always be considered as being unproblematic with regard to the use of resources. In particular, limited research has been undertaken on the consumption and long-term availability of minerals, usually required in the manufacture of energy converters and infrastructure. In this connection, the availability of rare earth elements, such as indium, gallium, lanthanum and neodymium, and other raw materials that play a significant role, such as nickel and vanadium, is of particular interest. The present study attempts to close the previous assessment gap, contributing to the holistic sustainability analysis of renewable energies. Since Germany’s energy turnaround means the country assumes a pioneering role on the international arena, the aim of the study was to provide an indication as to whether and how the transformation of the energy supply system can be shaped more resource-efficiently with a high degree of expansion of renewable energies. To achieve this, the study involved investigating which “critical” minerals are relevant in Germany for the production of technologies that generate electricity, heat and fuels from renewable energies in a time perspective up to 2050. In this connection, the assessment of being “critical” comprises the long-term availability of the raw materials identified, the supply situation, recyclability and the environmental conditions governing their extraction. In the first instance, all technologies referred to in existing energy scenarios in Germany that may be used in the decades ahead were included in the analysis, supplemented by infrastructure such as energy storage systems and electricity grids. Secondary applications such as batteries in electric vehicles that do not make direct use of renewable energies were not taken into consideration. The analysis was undertaken with reference to different long-term energy scenarios created in recent years for the energy supply system in Germany. These scenarios describe different trajectories for the development of renewable energies up to 2050, right up to the extreme case of the full coverage of electricity and heat requirements from renewable energies. The long-term need for new capacities was identified from these scenarios for relevant technologies. Based on these findings, roadmaps were developed in which the future market shares and the possible technological development of different types of plant were estimated. Linking the need for new capacities to specific material consumptions over time enabled cumulated quantities of minerals required to produce the necessary capacities by 2050 to be determined and assessed. The study shows that the geological availability of minerals does not generally represent a limiting factor in the planned expansion of renewable energies in Germany. It may not be possible, however, for each technology variant to be used to an unlimited extent. The supply of minerals in the use of biomass and biofuels in the electricity, heat and transport sectors cannot be classified as being critical either. However, the availability of biomass itself and the associated problems, especially land use and competitive usage, depending on the type of biomass, would have to be taken into account. These are not within the scope of this study though. Specific elements or sub-technologies of wind energy, photovoltaics and battery storage were identified as being critical with regard to the supply of minerals. However, there are noncritical alternatives to these technologies that could increasingly be used in future or that already dominate the market. The use of wind energy (both onshore and offshore) was investigated with regard to the consumption of neodymium (Nd) and dysprosium (Dy), which are increasingly being employed in high field strength permanent magnets in generators. If only geological availability is taken into consideration, all of the scenarios and trajectories considered here for wind energy utilization in Germany can be implemented, even if a similar expansion of wind energy is also assumed for all other countries. In spite of a high degree of availability, however, an adequate supply of the required quantities cannot necessarily be guaranteed for Germany. On the one hand, recovery from mines is poor, in some cases only 10 percent. Hence the minerals, available in sufficient quantities in principle, remain partially or predominantly unused. In addition, the very different environmental performance involved in their extraction must be borne in mind. Depending on the minerals extracted, processing technologies and additions of other materials to the minerals extracted, the mining of neodymium and dysprosium has a considerable environmental impact. On the other hand, there is excessive dependence on a few supplier states with a concomitant effect on security of supply. China is the only relevant dysprosium-producing country at present, for example. However, dysprosium is necessary in rare earth magnets in order to increase the otherwise very low Curie temperature of neodymium iron boron magnets to an acceptable level. It is currently unclear whether other supplier countries will be able to become established in the long run and under which conditions the mineral would be extracted (production costs, quality of storage sites, environmental legislation, and so on). In spite of the advantages of rare earth magnets (enabling more powerful, lighter facilities), established or novel technologies that do not involve the use of rare earths should therefore also be further developed, due to the risk associated with such a dependence. • The use of neodymium and dysprosium is non-essential for onshore facilities, since problems such as very heavy nacelles and expensive maintenance work for turbines mainly affect offshore facilities. At the very least, the recent rapidly growing trend of also using onshore facilities with rare earth magnets cannot be justified by the same requirements as for offshore facilities. Non-critical, electrically excited generators could still be used onshore, particularly in the 1 to 3 MW class. • In the case of offshore facilities, electrically excited synchronous generators could perhaps be used in the long run; here ceramic high temperature superconductors (HTS) partially take the place of copper in the rotor coils, exhibiting much lower generator weights and volumes than the current direct-drive synchronous generators. In addition, synchronous reluctance generators could also play a role in the long term. These types of generator do not require any rare earths, and achieve better efficiency and less heat loss than asynchronous generators. As long as facilities with rare earth magnets are used offshore, they should ideally be designed to be recyclable. Looking forward, the development of a recycling system ought to be tested so that at least recycled neodymium and dysprosium can be resorted to in 20 to 30 years’ time for replacement purposes. In this connection, it is essential to overcome procedural hurdles to facilitate top-quality recycling. The use of photovoltaics was explored with regard to the consumption of indium (In), gallium (Ga), selenium (Se), silver (Ag), cadmium (Cd) and tellurium (Te). In the assessment, a differentiation was made between crystalline photovoltaics and thin-film photovoltaics. The expansion of the silicon-based crystalline technology, which accounted for 97 per cent of new systems purchased in Germany in 2012, is non-critical in principle. It was assumed for various reasons that the technology would be phased out in Germany by 2020. The quantities of cadmium and tellurium required up to 2020 are regarded as unproblematic. The demand for indium does not appear to be secured in the long term. In particular, there is a major competitive usage due to increasing demand in LCD production, and simultaneously a high dependence on one supplier country (China). It would even be difficult to maintain the current market share (3 per cent in 2012) – apart from in a low trajectory of up to 0.66 GW installed capacity in 2050. It appears uncertain whether the need for selenium can be met from conventional sources, particularly because selenium is only obtained as a by-product. Hence a major expansion of this thin-film technology (up to 37 GW installed capacity in 2050) at least must be considered as being critical. In view of the prospects for the availability of indium as presented above, the efforts of the industry to replace the indium-based ITO TCO substrate of a-Si cells with other conductive substrates ought to be supported. If thin-film technology is viewed as being relevant to the market in the future, further research should therefore be conducted on thin-film cells with no or little indium or selenium. At the same time, the industry should be encouraged to design recyclable photovoltaic solar systems and to apply the requirements set out in the WEEE Directive (Waste Electrical and Electronic Equipment), which has also applied to photovoltaic solar systems in the EU since 2014. In order to further reduce the material consumption of photovoltaic systems in general, they should increasingly be integrated in other applications (for example, façades, roofs, semi-transparent coverings, glazing or shading devices). Electricity storage was investigated with regard to the consumption of lithium (Li), vanadium (V), nickel (Ni), potassium (Ka), lanthanum (La) and yttrium (Y) using the example of a system with a “very high” level of expansion of wind energy and photovoltaics. In this connection, consideration was given to battery storage for short-term, large-scale storage (redox flow batteries and lithium-ion batteries) and to alkaline electrolysis and hydrogen storage with reconversion in solid oxide fuel cells for medium- and long-term storage. Raw material supply for commonly available vanadium-based redox flow batteries must be considered as being critical. In particular, there is a major competitive usage because vanadium is an important alloying element, e.g. for tool steels. This is compounded by the fact that there are only three relevant producer countries, namely China, South Africa and Russia. It is recommended to use lithium-ion batteries, which are considered to be less critical from the perspective of resource availability, or physical storage facilities (pumped storage plants, compressed air reservoirs) for short-term storage, as long as no redox flow batteries with vanadium-free or -reduced electrolytes are available for the same purpose. Relevant alternatives are at the development stage; it is not yet possible to gauge whether these will succeed on the market, and if so, when. Research focuses primarily on scalability to high performance and storage capacity. • Alkaline electrolysis and hydrogen storage with reconversion in solid oxide fuel cells In terms of long-term storage, the analyzed hydrogen trajectory is expected to be considered as being non-critical. With regard to geothermal electricity generation, a relevant demand for various critical alloying elements cannot at least be ruled out in the case of a major expansion. There are several arguments in favor of assessing geothermal electricity generation as “relevant” with regard to its future demand for steel alloys (also compared to wind power): such arguments include the high demand for specific steel in deep geothermal energy plants and the poor substitutability of alloys, due in part to the high technical demands placed on the materials used. However, the data base is as yet inadequate for forecasting this demand reliably, meaning that no conclusions can be drawn at present for geothermal energy. Whilst the heating and transport sectors are most probably not considered as being critical in the event of the direct use of renewable energies, attention needs to be paid to the electricity sector with reference to the research question raised. Even if the availability of minerals for the relevant technologies is not a problem, potential supply risks owing to dependencies on a few supplier countries and competitive usages should be borne in mind. Although there is no urgent need for action in this case at present, the recommendations for action derived from the study should be implemented swiftly due to the long lead time inherent in research and development, enabling “critical” situations in the electricity setor to be avoided from the outset. One central aspect of the policy recommendations derived from the study is the proposal to focus in the medium term on efficiency and recycling strategies in the bid to secure Germany’s raw material supply. For example, increasing resource efficiency and recyclability should be key elements of technology development, and existing potential for recycling should also be exploited. However, every recycling process entails a considerable loss of material in some cases as well as a high energy input. In many cases (for example, where rare earth magnets are concerned) top-quality recycling is altogether difficult. For this reason, strategies for prolonging the useful life and life cycle of systems should be pursued alongside recycling strategies. In this case, close cooperation with industry is required. Researchers are particularly recommended to extend the analysis presented here to additional sectors and products for which minerals are required, to combine long-term energy scenarios with resource analyses, and to develop schemes for generally minimizing the use of resources in the transformation of the energy system. Finally, it should be noted that all of the findings shown here are subject to the provision that the assumptions and data concerning the resource situation are highly uncertain, and that any projection over such a long period should therefore be treated with caution. In addition, it goes without saying that the presented scenarios and roadmaps concerning technology and market development do not constitute “forecasts” in the narrow sense, but shall be viewed as possible trajectories that are contingent upon many assumptions.